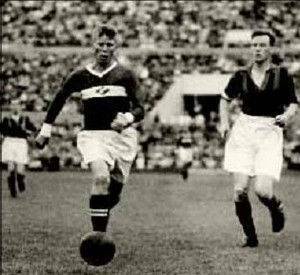 In the championship in 1954 left insider Nikolay Dementiev spent 17 matches and scored 7 goals. He was then 39 years old. It could not attract attention: preachy indicates how immaculately kept Dementiev sports mode, how carefully preparing for each output on the field. He was a clever tactician and neat, and was able to forget about yourself, remain invisible when it was required, and was able to recall his dribbling, soft and resolute, his a direct strike from a distance, which is called - "Dementiev's." Everything he did (and sometimes got up), different understanding of the situation, for him to understand the vicissitudes of football was a joy he was looking forward to the ball, knowing the next move. And this is football-wise looked like a boy! Short, light, with a whitish tuft cunningly winds of powerful defenders, he seemed to us from tribunes, playing with a squint, with a smile and not cocky, but good, certainly good, because anger, dark eyes, and he had all the light and truly see, to think out and contrive. Childishness he went on, the audience sympathized with him, feeling that the people in front of them, playing football masterfully, but fascination with the ball, which comes from our childhood. He came in after the war live in misery "Spartak" seemingly "little help" and held downright rebirth. Who could imagine that the heyday Dementiev's comes after almost thirty and last up to forty years old. Fate lovely in itself and doubly wonderful that refuted the common views. If long century by defenders or goalkeeper, is less surprising - they can save something in his movements. Dementiev was insider, and hence forward and midfield player at the same time, was the playmaker, from whom they expected assists frisky Simonyan and Ilyin, he kept pace with the young Netto and even had to accompany the right midfield opponent when he went to his attack. There is no concessions, no mercy - a game with all legs. When I watched him constantly reminded of boyish become the joy of the game, ease of movement and a clear mind. Movements by Dementiev were classics.